The following are recommendations made by the International Committee of the Red Cross (ICRC) concerning the surgical management of war wounds in austere conditions and with limited resources. This is when the provider has some or all of the following considerations which would prohibit him from performing serial (follow-on) debridement with associated post-operative care. The considerations above, accompanied with the position that the provider will be managing that patient for more than a couple days or become the definitive provider, should warrant ICRC recommendations for surgical management. -Pre-Deployment planning and Rehearsal should include a dry run using the equipment you will have available in a similar setting. This will help you identify any piece of equipment or drug you are missing. The following slides will help you plan and pack your sterile equipment from your TacSet as used in the 18 Delta course. -Assess the patient including labs if available. The patient should be as stable and resuscitated as possible before attempting surgery. How long has it been since the patient was wounded? What is the Hematocrit and Hemoglobin? UOP? You should first determine if any patient will be a candidate for expedited evacuation. If they will be on a an aircraft to a surgeon in the next 12 hours, you should make every attempt to reduce any tourniquets to 2-3″ above the wound or, if possible, convert it to a pressure dressing. -Decide if you have the time, resources and expertise to not only accomplish the procedure but to recover, nurse and rehabilitate your patient. -Small or low velocity wounds < 1cm (penetrating or perforating wounds caused by shrapnel) or puncture wounds. These wounds can be taken care of by utilizing local anesthesia techniques, washing (scrubbing) the wound with soap and water or disinfectant soap, irrigation, dressing, antibiotics and allowed to close by secondary intent. 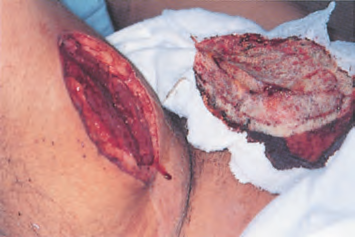 Some minor excision of the wound edges may be indicated. These wounds should be surgically explored if they exhibit swelling of intervening tissues (edema, hematoma) or other signs of injury to important structures or when presence of mud, grass or other non-metallic or organic matter has been introduced into the wound. -Plan the procedure by using our colorful treatment algorithm below and be sure to let your entire team know what to expect. You should probably even do a quick rehearsal to remind them of the surgical training you did with them predeployment. Intraoperative reminders can be done with the help of a white board or butcher block sized list of the steps so that everyone in the OR can quickly see what is coming up next. If no butcher block paper is available you can have someone read the steps out loud to everyone in the room. Be sure to let everyone know not to barge in once you begin. Post a sign on the door. Sterilize your equipment and prepare the area or room you will use. -Plan for your anesthesia strategy If you are sedating your patient you should have a plan for anesthesia in case things go wrong. This is where MSMAID comes into play. It will help you put together a plan. The minimum requirements of Monitored Anesthesia Care using the MSMAID acronym which was talked about in this podcast. -Intraoperative Circle of Awareness. Once you have your MSMAID plan for anesthesia you should monitor your patient and level of sedation using the circle of awareness ever 5 minutes until they have been off of anesthetic agents for an hour. Stop major bleeding and maintain hemorrhage control. Make adequate skin and fascial incisions for decompression of tissues and drainage of the wound. Remove culture medium such as dead and severely contaminated tissues to prevent/control infection. Handle gently and treat the tissues with respect, as always. Perform Delayed Primary Closure (DPC) or allow to close by secondary intent. The main difference between serial debridement such as daily dressing changes, etc. and treatment as advocated by the ICRC is that the ICRC recommends the removal of all the culture medium in one procedure and then limit the wound’s exposure to the environment. Culture medium, in this case, contains any tissue that will be susceptible to pathogen invasion and growth. Any tissue that does not have proper perfusion, such as contused tissue, or any questionable tissue should be removed. This is the main difference between performing serial debridement and ICRC recommended surgical management. In serial debridement, the plan is to keep contused or questionable tissue and revisit the wound surgically in 24-48 hours to see if this tissue survives. This takes time, personnel, supplies, places the patient under anesthesia and exposes the wound to the environment again. With ICRC recommended surgical management, remove all the culture medium. At the end of the wound excision, a bandage will be applied in good faith that all tissue at risk of infection has been excised. This same bandage will remain in place until DPC. If this bandage begins to seep through with serosanguineous exudate, it is simply reinforced with more gauze. In a dirty environment, keeping the wound and surrounding tissues protected from the environment until DPC is extremely important. A dry bulky gauze dressing that acts like a wick or Negative Pressure Wound Therapy (NPWT) will achieve the same goal in the austere situation. It will keep the wound protected from the environment and facilitate the drainage of exudate. It all depends on your resources which one to use. Daily wet to dry dressings in this situation should be solely reserved in an attempt to salvage exposed structures that may become necrotic due to desiccation in the event that those structures cannot be protected by soft tissue. Consider using a regional block in order to limit the use of parenteral drugs. It should not slough off, it should be very difficult to remove and bleed. There should not be excess redness or swelling around the site. It should not have a bad smell that fills the room. There should be a small amount of gelatinous-looking collagen build-up. Scrub vigorously with clean tepid water and a chlorhexadine scrubber. Irrigate chlorhexadine from the site, dry and cover. Open outer layer of sterile packs, gloves and gown. Scrub in for 5 mins using Chlorhexadine scrubber. Take control of limb from unsterile assistant and finish painting the part he was holding. Must set for 2 mins. Irrrigate iodine from wound in order to better visualize tissue. Minimally excise dead skin with a scalpel 1-2mm and elongate wound so that you can see everything. Ensure no vessels are left open to bleed by transfixing them. Irrigate with 1-3 Liters of water or until the water runs clear. Apply dry bulky gauze over the matrix layer. If you are not 100% confidant that you were able to excise all contaminated or devitalized tissue and have the time and resources consider a serial debridement the next day. -Recover and begin nursing care. A splint should be applied for 24-48 hours on the effected limb in order to prevent re-bleeding. The limb should be placed in the position of extension as much as possible in order to prevent contractures. Continue to monitor vital signs as the sedation agents wear off. The amount of time it takes for the agent to wear off will depend on what you used and how much. Remember the goal of sedation and analgesia here was to stay as light as possible while ensuring the patient felt no pain, didn’t move around dangerously and doesn’t recall the worst parts of the procedure. Ensure that post operative pain is controlled early. Active range of motion exercises in the unaffected limbs should begin as soon as the patient can physically tolerate it. Passive range of motion exercises on the injred limb can be started as soon as 24 hours post surgery. After 48 hours the posterior splint is removed and slow but deliberate active range of motion exercises should begin. Get the patient up and out of the ward as soon as possible. If you can get them outside in the sun, with family and friends the positive psychological effects will likely have an enormous effect on the patient’s outlook. At time of closure the bandage and dressing should be dry, stained (greenish-black), and have an ammonia like odor (good-bad odor). The dressing should be adherent to the wound. When removing the dressing, it leaves a slightly bleeding base of muscle that contracts. Any small area of collagen that wasn’t removed with the dressing can be scraped off with an instrument. This reveals a clean wound that is ready for closure. -Perform Delayed Primary Closure if the signs of wound infection are not present: The dressing sliding easily off the wound without resistance because there is a layer of pus between it and the wound surface, which may contain areas of necrotic tissue. The surface of the wound is dull – or greyish – red, or the wound gives off the “bad-bad smell” of wound sepsis. Such an infected wound requires further excision and DPC is delayed or the wound is allowed to close by secondary intent. Consider using a regional block in order to limit the use of IV drugs. The use of bacitracin after closure is a contentious subject for its use for surgical wounds among the medical community. It doesn’t matter if you’re for it or against it; there are a few things to consider about its use. This means that the suture line and all the area surrounding it will be exposed to the environment 2 or 3 times a day for 2 to 5 days. It can macerate tissues and delay wound healing if too much is used. A clean wound at time of closure is simply that. If the dirty wound didn’t get infected between excision and closure by keeping it covered, why does closing this change that principle? Patient is given IV antibiotics peri-operatively during closure that will give him coverage for at least the next 12-24 hours. The ICRC does not recommend its use. If your student decides to use it, you do not have to pretend that you are a professional cake decorator. You do not need to use sterile forceps to “ice the cake”. Applying Bacitracin is not a sterile procedure. The wound is closed. If you use it, don’t glop it on. It needs to be applied just like you would anywhere else. Put some on your finger and massage it into the tissue. In general, you think it’s infected. Unless you have a reason to suspect that it’s infected, leave it alone. If the dressing becomes soiled or wet, a clean dressing should replace it until suture removal. We should not be in the practice of inspecting or cleaning a suture line on a daily basis unless we have a reason for it. Remember that the ICRC does things for a reason. Because those things work in that environment. The ICRC always states that it is so hard to persuade western physicians to adopt their methods until those same physicians find out the hard way. Things that we may do stateside are not necessarily the best method to use abroad. That’s why the ICRC writes books about it. -Recover and Rehabilitate with the goal of the best quality of life possible. This will involve as much physical therapy at the patient will tolerate/complete and that you have time for. Seek out NGOs early and identify what they do and who they are willing to do it for. If you have to amputate a limb transferring the patient to an NGO that deals in prostetics would give the patient a better quality of life than leaving them with nothing. Now Listen to the Podcast!